who passed away on Friday, February 9, 2018. 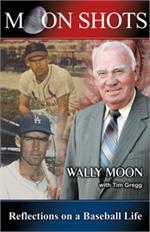 Wally Moon was one of baseball's standouts during the game's "Golden Era" of the 1950s and 60s. Through the end of his life he remained as he was in his playing days, a model of class and distinction. Here you'll find exclusive access to his signed and certified memorabilia, including his book, Moon Shots: Reflections on a Baseball Life.